Welcome to our Website we hope you will find it informative in planning your visit to our salon. 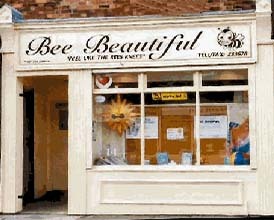 The Bee Beautiful salon is situated in the heart of Wellowgate, Grimsby. We are situated one minutes walk from Duchess Street car park and parking is free outside the salon after 6pm. We offer a comprehensive beauty & pampering service to help you relax and unwind from the stresses and strains of every day life. At Bee Beautiful we offer a range of Gift Vouchers of varying amounts that can be redeemed against any of the treatments that we offer. So if you have a special someone that has a special occasion on the horizon and you are stuck for ideas, why not treat them to a Bee Beautiful Gift Voucher so they can experience all that Bee Beautiful has to offer. To find out more about Bee Beautiful please feel free to browse through the various sections of the site and please don't hesitate to get in touch should you have a question or wish to book a appointment. If you would like to join our mailing list to hear about all our latest offers and promotions please click on the link below. Bee Beautiful, 28 Wellowgate, Grimsby, North East Lincolnshire, DN32 0RA. Phone / Answer Phone: 01472 233678.